This part of Greenwich Street south of Canal was still pretty much a manufacturing district back in 1987, although a few loft buildings did have tenants with appliances other than high-speed printing presses. 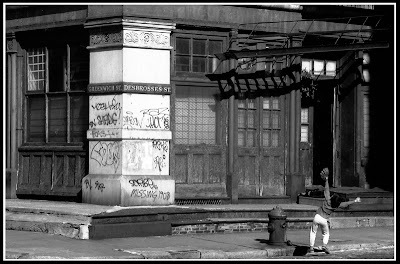 465 Greenwich Street stretches between Desbrosses and Watts Streets, and has undergone a complete rehab in the last twenty years, though I think there were already people living there back in '87. The entire neighborhood has moved as well, from manufacturing to (legal) residential and commercial zoning. When last here I could get a cup of coffee (in one of those 'Greek' cups) for sixty-five cents. On this Sunday morning a cappuccino cost me $3.50. Come 2007 we find the facades replaced and the stonework cleaned. 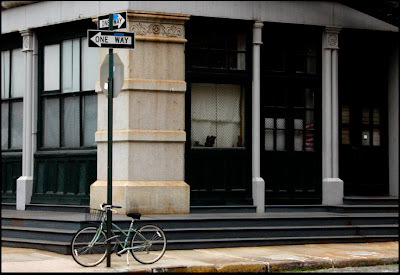 Of course, while sprucing up the building it was stripped of some of its old New York charm with the loss of the street names painted on the corner column. And of course, all the graffiti is gone. a shame, as that 'Missing 1908' really intrigued me for years. My family and have lived at 22 desbrosses st since 1977. How thrilled we are to see the photo with our son (now in his 30's) playing catch against the wall. We were heartbroken when the Greenwich - Desbrosses St sign was so carelessly removed by a sandblaster. Desbrosses St was a station on the 9th Ave. El. Yes, it stopped right there. Thanks.